Air101: The silent demise of Monarch as they slip into administration in the dead of night. 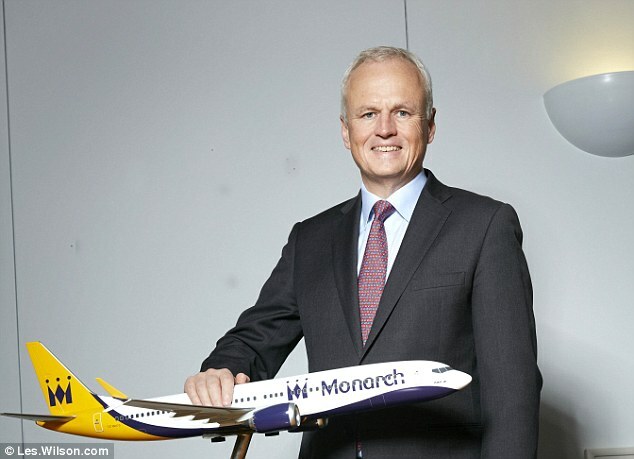 The silent demise of Monarch as they slip into administration in the dead of night. Monarch Airlines has ceased trading and slipped into administration in the middle of the night. The first official announcement came from an email sent to staff from Andrew Swaffield, who apologised and praised the owners - read the full email here. The email reads, his is the update I hoped I would never have to write. 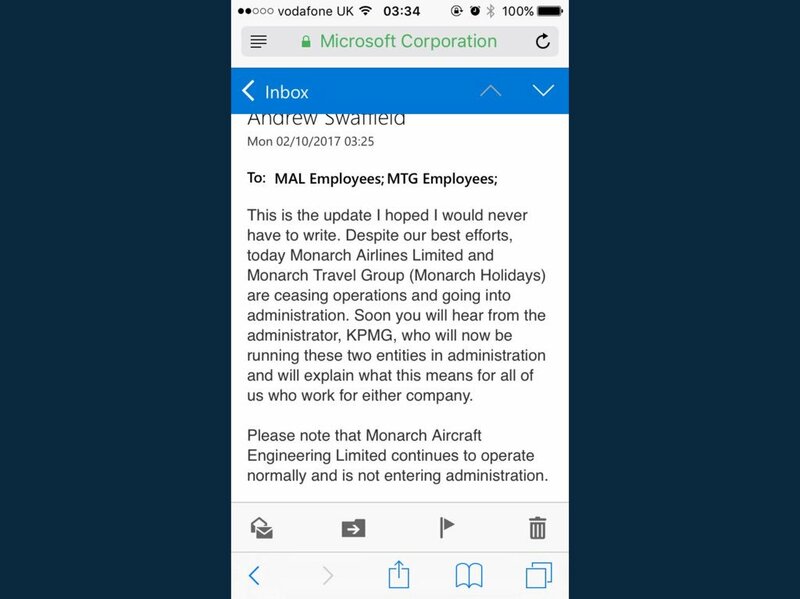 Despite our best efforts, today Monarch Airlines Limited and Monarch Travel Group (Monarch Holidays) are ceasing operations and going into administration. Soon you will hear from the administrator, KPMG, who will now be running these two entities in administration and will explain what this means for all of us who work for either company. 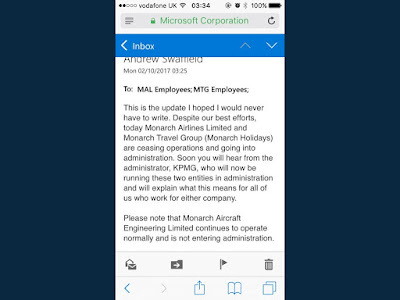 Please note that Monarch Aircraft Engineering Limited continues to operate normally and is not entering administration. Our owners, Greybull Capital, showed great courage when they bought us in 2014 and have provided us with continuous support. We had a turnaround year in 2015. But since then, outside influences have badly affected us. Since 2015 we’ve seen yields collapse by a quarter, resulting in £160 million less revenue. This has especially affected Spain and Portugal which is 80% of our business. This year the airline is carrying 14% more passengers than last year for £100m less revenue. The root cause is the closure, due to terrorism, of Sharm-El- Sheikh and Tunisia and the decimation of Turkey. Despite these challenges we managed to cut £40 million out of our cost base by reducing overheads and being more efficient and wasting less, however the yield reductions have turned our airline from one that made £70 million profit in 2015 to one that made a £60 million loss in 2017 and was scheduled to lose over £100 mililon in 2018. We asked a respected aviation consulting firm to review how we could improve our short haul network and they came to the conclusion that it was pretty much out of our control. At the same time we built our long haul plans and asked them to validate these plans, which they did, and agreed that they were attractive and viable. The next challenge was how to pivot our airline from short haul to long haul to reduce losses. We decided to ask KPMG to run a sales process to see if anyone would be interested in taking on all or some of our short haul operations or assets. This would have allowed us as Monarch to start long haul flying in spring of 2018. Regrettably although there was considerable interest, there was no deliverable offer, and so we have run up to the 30 September Atol renewal deadline without a viable plan for the next twelve months and the CAA has understandably been unable to license us. As a consequence of this we lost any prospect of avoiding an insolvent liquidation and have been left with no option but to file for insolvency and cease operations. Unlike many other countries, the UK does not offer a viable insolvency track for airlines to keep operating during administration and so we were forced to cease operations. Millions of customers have flown and holidayed with Monarch over the last 50 years. I am so sorry that thousands now face a cancelled holiday or trip, possible delays getting home and huge inconvenience as a result of our failure. We are working with the joint administrators and the CAA to do everything we possibly can to help minimise disruption where we can, but are under no illusion as to the problems this will cause. And many suppliers will suffer hugely as a result of our insolvency – for which I am equally sorry. Many of you have spent years working for this company and I want to thank you again for your service and loyalty. I am truly sorry that it has ended like this. You can all hold your heads up high and be proud of what you achieved at Monarch. It has been a company that has cared for its customers and which has been like a family for many people for five decades. I cannot tell you how much I wanted to avoid this outcome and how truly sorry I am. I wish you all well in your future careers and hope you will all retain a fond memory of the spotty M and all it stands for. The MAEL team will be doing everything possible to ensure that our engineering business survives and prospers and carries forward the Monarch name with pride and dedication to professionalism and service. Thank you and I wish you well, wherever you are based. The slow demise of Monarch occurred just before the midnight expiry of the ATOL licence that allowed Monarch Holidays to sell and operate package holidays. The airline cancelled two flights in the last forty minutes of Sunday, before the deadline at boarding stage. ZB418 from Birmingham to Ibiza and ZB298 from London Gatwick to Ibiza were both cancelled at the while passengers waiting at the boarding gate. 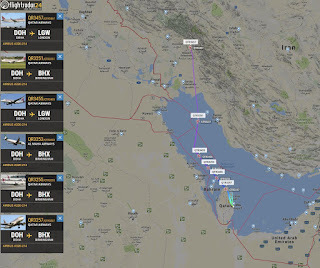 Two Qatar Airways that had previously be relocated to London Stanstead with crews on standby, departed the airport heading to Ibiza to repatriate passengers, using a British Airways flight code and scheduled to return under a BAW code. 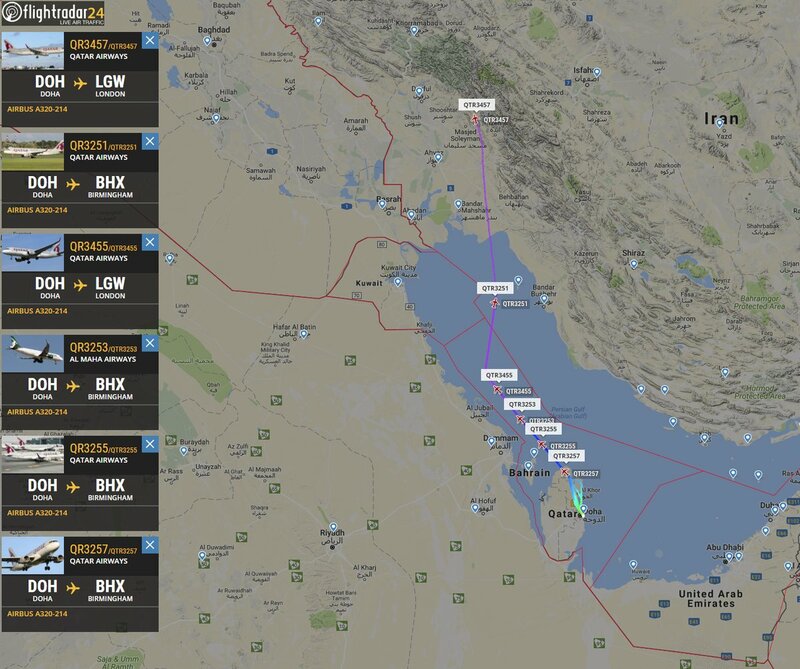 Qatar Airways have started to operate positioning flights from Doha to the UK, which according to Flightradar24 is at the request of the Civil Aviation Authority. Other charted aircraft from airlines such as Titan and AirTransat have been mobilised and are scheduled to operate flights from Faro back to the UK. 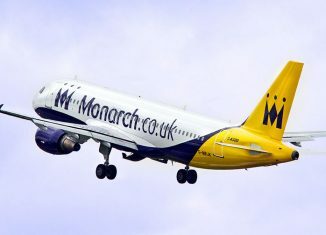 Monarch was the UK's fifth largest airline, it was founded in 1968 and flies to over 40 destinations from five UK bases: London Gatwick, Birmingham, Manchester, Leeds-Bradford and Luton. The airline offered up to six million sector seats to mainly leisure destinations. 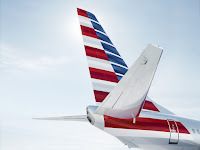 The airline was due to celebrate its 50th birthday next year with the arrival of new Boeing 737 MAX 8 Aircraft to revolutionise its short to medium haul route network. As a company, it opened its in-house tour operator Monarch Holidays, which offered trips to all the popular holiday destinations. However, in common with many tour operators, they saw a downturn in business after recent terrorist atrocities. It is the holiday side of the operation that required an ATOL licence in order to trade and that expired at 23.59 Sunday night. The company employs approximately 2,750 predominantly UK based staff. 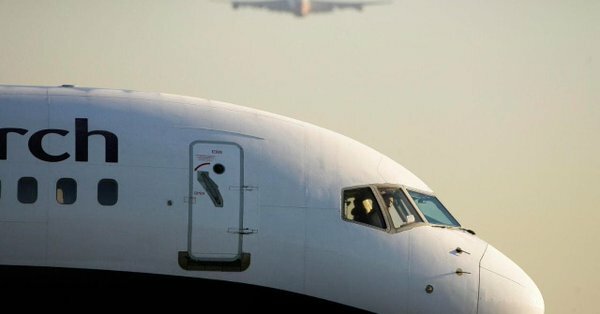 It is possible the airline could survive the period in administration if KPMG work to find a buyer, someone to buy either part of all of the business.